Both groups [i.e., Young Earth Creationists and mythicists] are known to abuse science (and in the mythicist’s case, the science of history) to their own ends, with one embattled mythicist resorting to a highly technical field outside of his own in an attempt to cast doubt upon the historical person of Jesus. Indeed, this later mythicist, because he refuses the title of mythicist, has lost many fans among the one true sect of mythicists. I think Joel is obliquely referring to Neil here. The post to which Joel refers on Dr. James McGrath’s site, Exploding Our Cakemix, actually harms Joel’s case, but — true to form — that fact escapes both Joel and his fellow scholar. Before I forget to mention it, I love the unintended irony of Joel’s comment about “resorting to a highly technical field outside of his own.” And I will resist the urge to question the use of the term “the science of history,” despite its interest to me personally, since such a discussion would take us too far afield. Anyhow, back in February 2012, Dan Wallace and Bart Ehrman engaged in a public debate over the text of the New Testament. At one point during the proceedings Wallace breathlessly announced that a new fragment of Mark had been found, which he (or rather a palaeographer with “no theological bias”) confidently dated to the first century CE. He implied that this early fragment would prove that, contra Ehrman, the later canonical text of Mark had deviated very little from the authentic text of Mark. If this manuscript is really before that [i.e. before the optimistic dating of P52, between 100 and 150 CE], we can expect some rebuttals, although as they usually are, nonsensical, from the mythicists. How will this affect my thesis work? Not sure. First, we have to see if it is a complete Mark and, then, what the date is. As for the question on Joel’s mind, will it spell the end of mythicism if it turns out to be true that a first century manuscript of the Gospel of Mark has indeed been found? Of course not. Has any evidence for evolution ever spelled the end to young-earth creationism or Intelligent Design? You may notice that James (and apparently Joel, as well) assiduously uses the modifier “young-earth” when deriding creationists. That’s because he and other fans of BioLogos-style accommodation believe in “evolutionary creation,” which is a fancy term for “old-earth” creationism. OEC woo is more “scientific” than YEC woo. There are no answers, facts, or otherwise a mythicist will take as valid, just as the young-earther will continue to deny evolutionary science. Of course, an “old-earther” would accept evolution — as God’s tool for creation. How anyone can reconcile the bizarre life cycles of parasitic species with a loving God is beyond me. Not in my wildest nightmares could I have conceived of the Cymothoa exigua. But again, I confess that I am not a scholar, so perhaps I don’t possess the necessary skills for this sort of accommodational thinking. Pst. Mythicists George Albert Wells and Earl Doherty have always dated the Gospel of Mark to the first century — or at least Wells has dated it from 70 on and Doherty up to no later than 90. Even Arthur Drews put it at 70 onwards. And Price also, iirc, is happy with a first century date as a valid option. Perhaps Dr McGrath hasn’t got to page 3 of Doherty’s book yet. That last jab refers to James’ penchant for misreading (or not reading) Doherty’s book, which he pre-panned on Amazon. To such prodding James is, of course, impervious. You’ll notice that Neil’s comment was focused on a rather obvious point. Most published mythicists agree with the modern consensus on the dating of Mark — around 70 CE. Joel’s and James’ unawareness of this fact brings up an interesting question: If they don’t know such basic facts about the people they continually vilify, then is their rabid animosity a result of a distaste for the conclusion rather than (as they claim) a disgust for their methods? If the former is true, it would help explain McGrath’s clairvoyant review. There are indeed some mythicists who date the Gospel of Mark to the first century, just as there are some who attribute them [sic] to Marcion or anti-Marcionites. Since mythicism is not based on evidence, no particular view of the date of sources corellates [sic] with it and no evidence will ever be considered to refute it. At least from the perspective of the mythicists themselves. That was my point, for those who may not have grasped it. Let us ponder James’ logic. Evidence that Mark was written in the first century CE would affirm what “some mythicists” (viz., Doherty, Wells, et al.) already believe to be true. But mythicism is not, according to Dr. McGrath, based on evidence. Hence, “no evidence will ever be considered to refute it.” It is, sadly, unclear exactly why mythicists should change their minds when faced with confirming evidence. Neil responded with many questions. However, James doesn’t like lots of questions, so he declined to answer them. However, he did deign to write another post in which he asked, “Is Mythicism Falsifiable?” (It’s a classic case of McGrathian misdirection.) And this is the post that Joel refers to in his HuffPo piece. As Neil Godfrey helpfully drew attention to in a comment, there seems to be no agreement among Jesus-mythicists about when the earliest Christian sources were written, which sources are the earliest, or which ones are authentic. This ought to raise suspicion that mythicism is a preordained conviction in search of any arguments that can be used to try to promote it, rather than a conclusion. It is unclear why they should be in agreement (either among themselves or with the mainstream) on these matters. Nor is it clear why disagreement on any matter in NT studies should automatically point to a “preordained conviction.” In fact, the accusation of a “preordained conviction” hovers dangerously close to a well-known, but little-discussed, real problem in NT scholarship. Let’s see if we can spot it in Joel’s HuffPo article. I don’t have the “guidance of Tradition” to help me get to know the real Jesus. I suppose if I did, a lot of the problems in NT studies would become much easier to resolve. For one thing, I would already know that Jesus exists since I’d be chatting with him every day. Unfortunately, I don’t have the luxury of preconceptions, which is why I’m an agnostic on the Jesus question. So, what does Joel think is recoverable from the historical record regarding his Lord and master? What I believe is recoverable is not the stuff of legends or myth, but one of a real person embroiled in a dangerous tango of revolution. I have never been embroiled in a tango, but it sounds painful. I kid. Normally, I have no problem with mixed metaphors (e.g., “to take arms against a sea of troubles”) unless they’re poorly executed, like the one Joel just offered. During this time, when nerves were exposed to the wintry mix of the whispers of ‘Revolt!’ any man heralded as a prophet, and especially one who spoke against the Temple’s corruption and the extravagant inequality between the classes would meet an apprehensive Rome (we have historical examples of this). All right, maybe it’s just me, but Joel’s writing gives me an ice-cream headache. “When nerves were exposed to the wintry mix of the whispers of ‘Revolt!’?” Yes, it’s true that George Orwell recommended never using well-known similes and metaphors since they were apt to be so well-known as to evoke no emotional response. However, if a writer lacks the ability to invent new, well-crafted figurative expressions then he or she should write in good old simple English. Well, if he is going to rule the world, doesn’t that mean he is going to save the world too? And if he saves the world, isn’t he something more than a prophet? And doesn’t the world also include Gentiles? Where’s Hillel in all of this and what is Paul talking about anyway, Peter? What? Who said anything about Hillel . . . or Peter? Finally, at the end of Joel’s train wreck of an article he says something I can almost agree with. 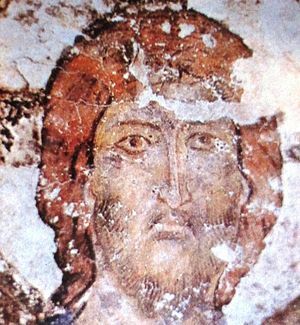 Jesus is a historical person, but we may not like what he looks like — if we ever find him. If Jesus turns out to have been a real, historical person, we probably would not be able to identify with him, agree with his beliefs, or even like him very much (even if he was a handsome son-of-a-godgun) — but we’ll probably never find him. I don’t really understand how liberal Christians can simultaneously look for the historical Jesus and believe in the spiritual Christ. However, it could just be a personal problem. I’ve always had difficulty believing in contradictory models of the universe. I can’t seem to reconcile the belief that Jesus is both the Lord of Creation and a dead, misguided, failed Jewish prophet, nor can I find any accommodating middle ground that explains the horrors of human history with the existence of a loving God. But I am not a Christian scholar. Posted on 2013-06-24 02:20:55 GMT+0000 by Tim Widowfield. This entry was posted in Apologetics, Biblical Studies and tagged Historicity of Jesus, James McGrath, Joel Watts. Bookmark the permalink. Ah, but Joel has an out. He follows Tradition with a capital “T.” Neil could only follow the (lower-case T) tradition of mythicists. this is petty. The subjunctive is all but dead in modern English and sicing a “was” is just ridiculous. Anyway, it is correcter to call in “irrealis than “subjunctive”. I have news for you, Jens. It was all but dead even before 1940, when Chandler’s Farewell, My Lovely was published. That’s why the bit about Marlowe calling Marriott a “Harvard boy” is so funny. I guess you missed it.
. . . the land of Judea had lay [sic] in a bitter calm as Rome marched on . . .
“More correct” is more correct than “correcter.” That’s a petty joke, Jens. I hope you enjoyed it. I’m sorry, but you are wrong. The subjunctive mood falls under a group of moods called “irrealis.” Other moods that fall under irrealis include the optative — which you may recall from ancient Greek — and the jussive — which you may recall from ancient Hebrew. If you need further help understanding either grammar or humor, I’m here to help. Since we’re all okay with pedantry, why did you put the first sic in Joel’s title? “What if [sic] Jesus” Since your title has the same first three words. The word “if” in his title is a subordinating conjunction, and as such should be capitalized. By the way, I applaud the fact that he capitalized “Was.” Many people don’t capitalize “to be” verbs in titles, but they are verbs and should be. Ah, but Joel didn’t capitalize “was” on his blog, so your praise should go to the HuffPo editor, who probably wrote the hed to begin with, which complicates matters. The HuffPo has editors? That’s adorable. Attention grabbing heds don’t write themselves. “Editor” should have had scare quotes. SEO manager closer to the truth. Reports of the death of the subjunctive are greatly exaggerated. It may not be in full health but it is no closer to extinction than the elephant, at least in educated circles. If the failure of proper grammar in the title were Watts’ only crime then it would indeed be petty to highlight it, but considering the nature of the rest of his article it is just the tip of the iceberg and fair game in my opinion. I like the subjunctive. I’m even somewhat fond of “whom,” although I can understand why its usage is fading. But then I’m an old fart. I agree with you. Scholar Joel’s usage of poor grammar and mangling of the language represent merely the tip of the iceberg. The issue with these scholars who claim certainty of the existence of an actual Jesus of Nazareth is that they fail to recognize, or perhaps even understand, confirmation basis. The statement above is a clear indication that this is what is going on. Tradition is confirmed by bits and pieces of evidence that can be fit into the traditional Jesus story. This is circular reasoning that is sustained by confirmation basis. Evidence that doesn’t fit this picture is dismissed. To me, Romans 13 completely undermines the belief that Paul’s understanding of Jesus included a crucifixion at the hands of either Roman or Jewish authorities. It’s a recognized problem in the field (see Keck, for example, on this question). Yet in the face of a clearly positive statement that seems to preclude the execution of an innocent Jesus, Jesus scholars want to insert the word “Romans” into 1 Cor 2:8. 1 Cor 2:8 then confirms the already drawn conclusion that Paul is talking about the gospel story of Jesus’ execution. These are unquestioned assumptions that undermines the credibility of the scholars in the field. To me, without confirmation basis, Romans 13 outweighs 1 Cor 2:8 which makes no mention of a crucifixion at the hands of Romans, let alone a particular Roman named Pilate. As an aside, I sometimes try to challenge myself on the basis that my personal views on this question go against the consensus of experts in the field. I rarely find myself on the opposite side of the experts. I side with 99% of climate scientists on the question of climate change, 99% on evolution. I am not a conspiracy theorist and do not hold contrary views on 9/11, the murder of JFK, UFOs (including the Roswell crash)…IN all these cases, I find the arguments of the experts to be convincing, compelling, and encompassing. That is not the case when I look at the question of the historical Jesus. I see strongly stated positive statements that are not sustained by the supporting evidence. Contradictory evidence is ignored or swept aside with thoroughly unconvincing ad hoc rationalizations aimed at smoothing out or avoiding cognitive dissonance. Dealing with the issues raised by critics who believe the Jesus-meme evolved out of a process of accretion causes too much discord. When a scholar like Joel talks about finding Jesus, I can’t help but think of Vonnegut’s Slapstick and the characters in it who belong to the Church of Jesus Christ the Kidnapped. He was so absorbed in firing ardent glances this way and that, that it was wholly uninteresting to him that he had just handed a leaflet to the President of the United States. “May I as what you’re looking for, young man?” I asked. “For our saviour,” he replied. The comparison between mythicism and creationism exposes how intellectually bankrupt Joel’s position is. He thinks that the ToE gets its respect from “tradition” just like his own scholarship, when in fact the ToE gets its respect from its methodology; a methodology that I’m sure he would (if he hasn’t already) flatly reject.